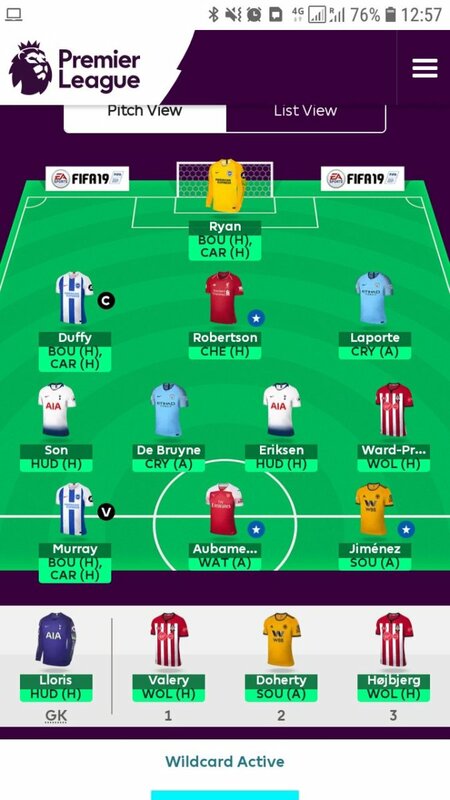 Jordan has used his wildcard, Free Hit and triple captain. Apologies for not putting my team on here last week, accidentally forgot to press send on the email. Will be a relatively short one from me this week as I’m strapped for time. Another poor week, down to 8.7k which is comfortably the lowest I’ve been since GW16. Not picking Hazard was my big mistake that cost me. 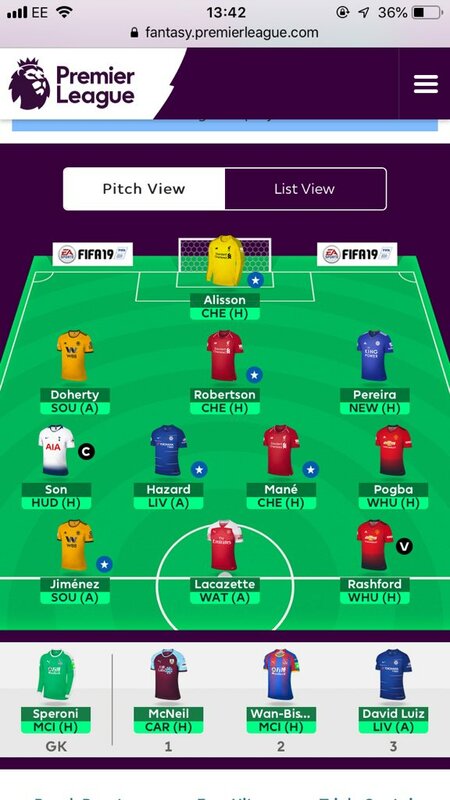 Has 4 returners: Hazard, Wan-Bissaka, Pereira and Luiz with my 3 Liverpool players disappointingly not returning. Also rather disappointed that Lacazette didn’t return either with the alternative to him Vardy returning big. Son in for Jorginho this week with Spurs having a great fixture this week and a double next gameweek. Also with Kane now being injured that should improve Son’s chance of returns further in my opinion so this was a no brainer. Tough fixture for both my Liverpool and Chelsea players but with it being at home I back Liverpool to win so both my Liverpool defenders start with Luiz on the bench. Joining him on the bench is Wan-Bissaka vs City for obvious reasons and McNeil vs Cardiff as I think all my other midfielders and forwards are more likely to return. Keith finished with a 3k OR last season, an incredible OR of 325 in 16/17 and 9k in 15/16. He is one of the top 10 FPL managers I follow weekly who’ve finished the last 3 seasons in the top 10k OR. Here’s his wildcard team as it currently stands:. Mikael has used his triple captain and free hit and has activated his wildcard this week. Here’s his wildcard team as it currently stands. 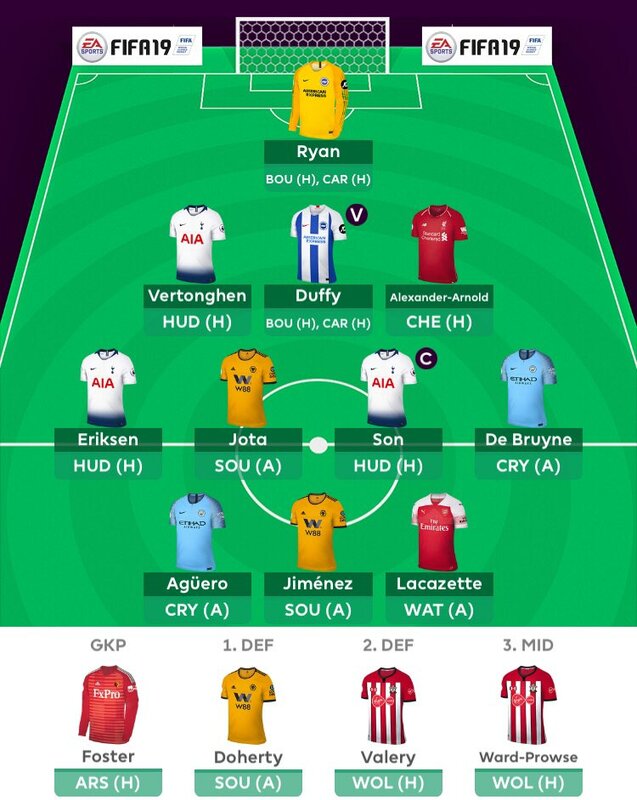 Alex has used his triple captain and free hit and has activated his wildcard this week. Here’s his wildcard team as it currently stands. A few changes from the first draft, largely down to the Kane and Deulofeu injuries. I know Trippier carries rotation risk but the Huddersfield fixture is too good to ignore. I have decided to bench all Wolves players this week as they have a tendency to underperform away at struggling clubs and they may also still be gutted from their FA cup exit. The double up on their defence is a risky one but I remember Boly likes to score against the big clubs, and Arsenal will have an eye on the Europa League. BOLD captain choice in Murray this week!! I’m praying to Chris Hughton he at least starts both games! As previously stated my planned transfer of Murray -> Deeney next week is still going ahead, along with my bench boost. Sergio has used his free hit and has activated his wildcard this week. 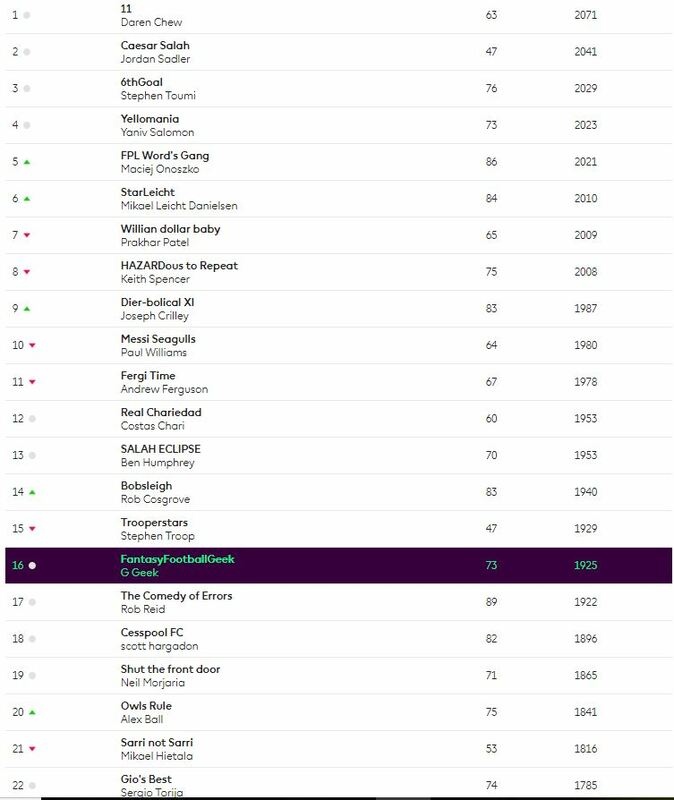 At last a great week for me with 74 points and a GW rank inside 200K. It being a blank GW with few of the other popular captains blanking combined for a big green arrow, the fifth on the spin so getting onto some form at the time of the season when it matters most. Admittedly most of the week success came from Mr Hazard as captain, but still 5 other returning players was good, indeed 6 other returners, just Barnes scored one of his goals in the wrong net. This week is all about wildcarding for many of us to set a squad of 15 for the bench boost chip next week. Still without trying to ignore the remaining fixtures till the end of the season. 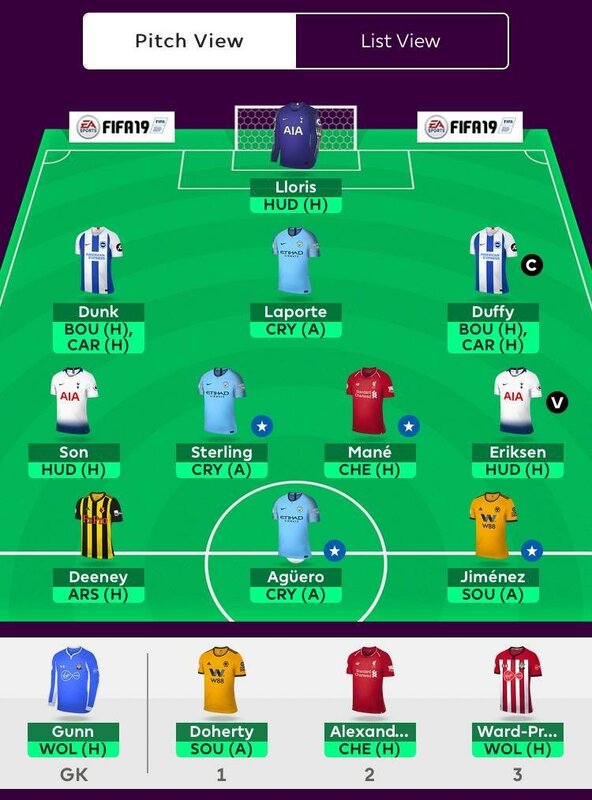 Luckily, most teams I am interested in for in GW35 double have good fixtures in GW36-38 as well, which paired with free transfers will allow me to have teams to be happy with each gameweek. I was always going to change bits from the earlier draft, but Kane’s injury certainly ensures that. First in defence I’ve gone Trippier to Laporte and Leno to Lloris, this feels safer in terms of rotation and adds a City defender rather than an Arsenal one. 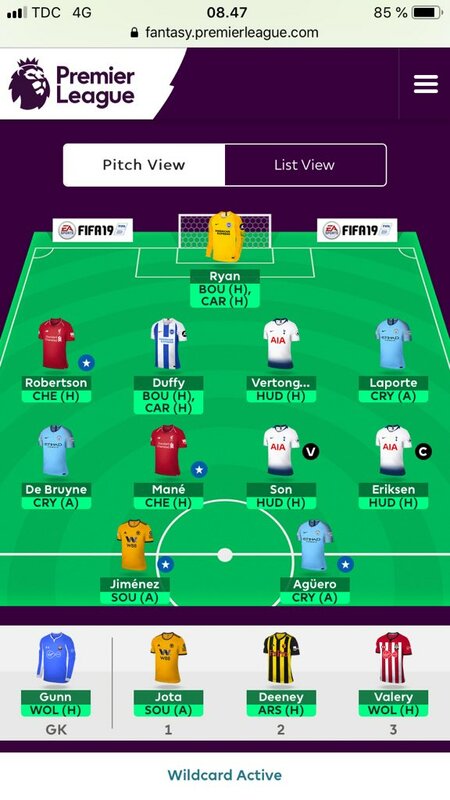 Finally Kane is replaced by Jimenez which means I am swimming in cash, so tinkering continuing throughout the rest of today up until the deadline I imagine! Good luck for GW34 Geekers !